Upper Mustang trek gained popularity after it opened up to tourism in 1992. This remote and unstirred region has seen a rise in tourism in the last few years. It lies in the region between Manang and Dolpo in the north-central part of Nepal. It is very close to the Tibet region in China. It earned the name ‘The Last Forbidden Kingdom’ as it was the last region in Nepal to be ruled by a king. This region has a rich history and a vibrant culture. This has made this region quite popular with people who not just come to Nepal for its natural beauty but to experience the culture too. The word Mustang has been derived from the Tibetan word Mun Tan and its rough translation is fertile plain. Despite the name, this region lied in the rain-shadow area of Annapurna and Dhaulagiri range. This has turned the land into a mountain desert. This isolated region boasts a different kind of culture and lifestyles. A region which has stayed away from the modern world, you will be amazed when you head to this region. You will come across vast deserts and will occasionally find villages where you will find teahouses to spend the night. This region is barren landscape which has been changing with the constant erosion over the centuries. You will see the world famous sky caves which have baffled historians and archaeologists as they are unable to find the origin of these sky caves. Upper Mustang is certainly up there with the other trekking routes in Nepal. Unimpeded view of Annapurna and Dhaulagiri Ranges. The sky caves which are perched high up on the arid hills. The walled city of Lo Manthang(also the capital of Mustang). Flight from Pokhara to Jomsom which offers a spectacular view of the mountains. You will be picked up at the airport and transferred to a hotel by our staff members. You will be tired after a long flight. So, you can rest and have a great time trying the local cuisine. Plus, you can shop and prepare for the trek. We will take a tour of the Kathmandu the next day. There are 7 UNESCO world heritage sites with it. We will be visiting Pashupatinath Temple, Swayambhunath stupa, Boudhanath stupa, Changu Narayan Temple, Kathmandu Durbar Square, Patan Durbar Square and Bhaktapur Durbar Square. Later in the evening, we need to prepare for the trek and secure travel permits. We take a bus from Kathmandu to Pokhara which is going to take around 6-7 hours. You also have the option to take a flight from Kathmandu to Pokhara. In Pokhara, you can stroll around the tourist hotspot, Lakeside. We spend the night in Pokhara. On the fourth day, we take an early morning flight to Jomsom. Here, we will eat our lunch and then head to Kagbeni. Kagbeni is beautiful village located at an altitude of 2910 meters. We spend the night in Kagbeni. If you wish, there is also flight option which will take about 25 minutes. To get beyond Kagbeni, you need a permit. So, you will get your permits checked and then head on to your journey. We then continue our trek and walk along the banks of Kali Gandaki river. We then head up a hill and reach the village of Tangbe. Here you will see narrow alleyways, white-washed houses. We will have our lunch and then head to Chele. It takes 5-6 hours in total to reach Chele which is located at an altitude of 3050 meters. On the sixth day, the trek gets a little more challenging as we have to cross two passes called Taklam la Pass and Dajori La Pass. They are located at an altitude of 3624 and 3735 meters respectively. We will enjoy the spectacular view of the mountain ranges and also visit the Ramchung cave. We then reach the village of Samar and carry on with our journey until we reach Syangboche. We will be walking a total of 6-7 hours. We will start our journey early in the morning after breakfast. The trek distance from Syangboche to Ghami is 9.3 kilometers. You will pass through Yamada La Pass. We will also come across several small Tibetan villages. We will then head up to Nyi La Pass which is the highest point of the trek. This pass is situated at an altitude of 4010 meters. After this, we will head down to the village of Ghami, located at an altitude of 3520 meters. It takes 5 to 6 hours to cross Ghami to Tsarang within the distance of 10.7 kilometers. On the eighth day, we will start our journey with descending to a canyon and then cross a river to again start our ascent. We will then head to Lo La Pass (3950m). From here we can admire the view of the villages down below and the spectacular view of the mountain ranges. Then we’ll head and stay at Tsarang, another old and beautiful village. Along with scenic beauty, it is popular for old palaces and Buddhist monasteries. Trek distance from Tsarang to Lo Manthang is 11 kilometers. The walking trail for this day is flat, wide, and gradually up. It will take about 4 to 5 hours. The trail upto Lo Manthang is full of remoteness, adventure, and natural beauty. Lo Manthang (3730m), which is also known as the walled city, offers you a spectacular view of Nilgiri, Tilicho, Annapurna, and Bhrikuti peak. When you’ll enter the city, the ancient and unique Tibetan culture will simply awe you up. Lo Manthang is the capital of Mustang and is a historic place. 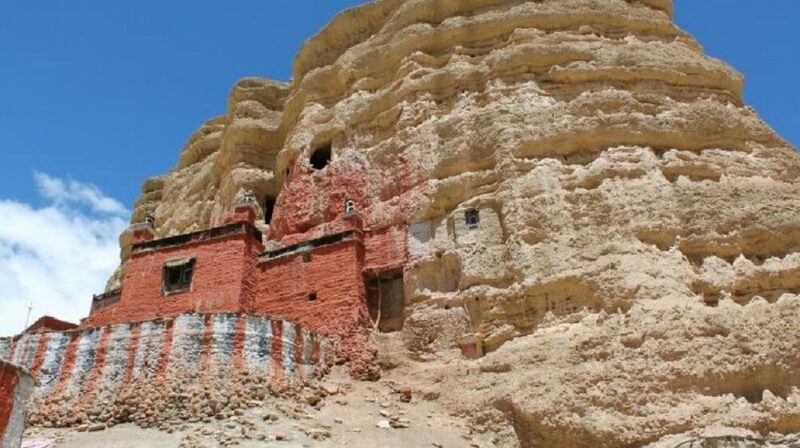 This part of Upper Mustang Trek has fascinating and endearing lands. We will visit the Gompas and also explore Jhampa, Thupchen, and Chhoeda. We can also visit Choeser and the sky caves which is just a few hours walk from Lo-Manthang. Choeser is popular for ancient monasteries and scenic mount views. We spend the night in Lo Manthang after a day of exploration. Instead of descending back to Jomsom from the same route, it is better to take an alternative route from Drakmar. We will explore the Ghar Gompa, supposed to be 1200 years old. There are many attractive rock paintings as well. Drakmar, at the altitude of 3,810m, suffers strong wind almost every afternoon. But at evening, you can explore nearby villages and local areas. You will walk about 7 hours this day. On the 12th day, we start our journey early in the morning and make our way to Ghling (3806m). This will be another long and tough walk day upto 7 hours. Enjoy the trip and local beauty of Ghiling! Final walking day of Upper Mustang Trek. A little longer one though! From Chhuskang, we head on with the trail and after 5-6 hours, we will arrive at Kagbeni. Enjoy the view of the mountains and the trek finally ends when we reach Jomsom. We take an early morning flight to Pokhara. It will take about 25-30 minutes to get there. We can explore Pokhara and go boating in Phewa lake. In the evening, the buzzing street of Lakeside will provide you with ample entertainment. We then head back to Kathmandu on the 16th day. It will take 6-7 hours on the bus. You have the option to return through flight which will take 25 minutes. Enjoy your last night in Thamel which is the tourist hub. The time has come for you to head back to your home and share your wonderful memories of Nepal. Also, we would be delighted to be at your service if you decide to extend your stay in Nepal. We provide various tour services.